This post was sponsored by Cost Plus World Market and I was given a gift card in compensation for this post. However, all ideas, photos, and opinions are my own. This post also contains affiliate links. For my full disclosure policy, click HERE. Gallery walls are a popular interior design feature that are a great way to display some of your favorite pieces of art and photographs. I just love the way a wall gallery looks, all of those frames nestled so closely together, weaving a story of our loves, memories, and families. I also have a deep-seeded love for books and home decor magazines and my house is overflowing with them (perhaps you, too, know what this is like?). 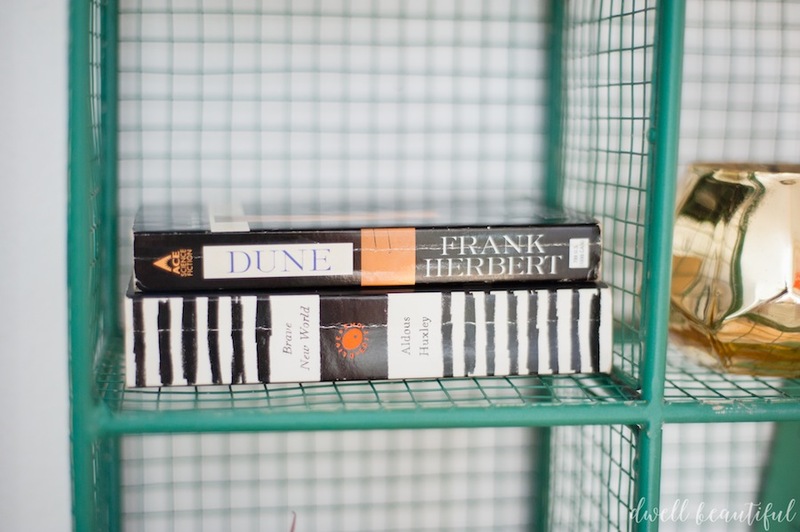 However, I also love a neat, and tidy house, with a pop of color, but the problem is that my house is pretty small and there isn’t always a designated place to keep my ever-growing collection of books and magazines. But then I realized something brilliant about how to save space. Gallery walls don’t have to be all about the art – they can be functional, too! I can use my books and magazines as not only wonderful things to read, but also as beautiful decor. 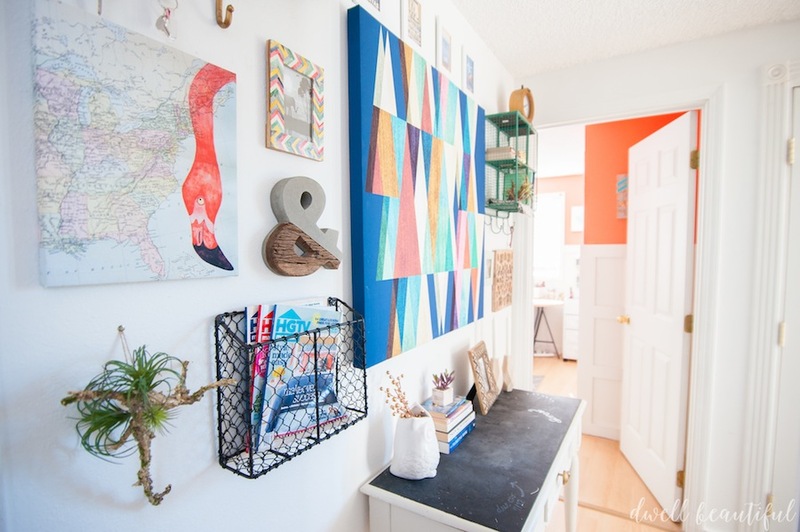 I’m here to show you how to seamlessly incorporate storage pieces into your gallery wall to save space while still having them blend in with your art and not detract from the beauty. Have a small house with minimal storage? No problem! Learn how to use items you’re storing as visual interest pieces while keeping them up and out of the way with help from Cost Plus World Market! And pssst, stick around for a super awesome giveaway at the end of this post! Just as a refresher, this is what my gallery wall looked like before it got a makeover from Cost Plus World Market. Perfectly adequate and even fairly nice looking, but no spark, and definitely no functionality or storage. So I went to my local Cost Plus World Market and went on a happy shopping spree of joy and picked out not only some amazing art for my gallery wall, but also some storage pieces that will make my life so much easier. Colorful magazines (like HGTV!) are a great candidate to store in your gallery wall. The graphic and bright covers are pleasing to the eye and look almost like art themselves. 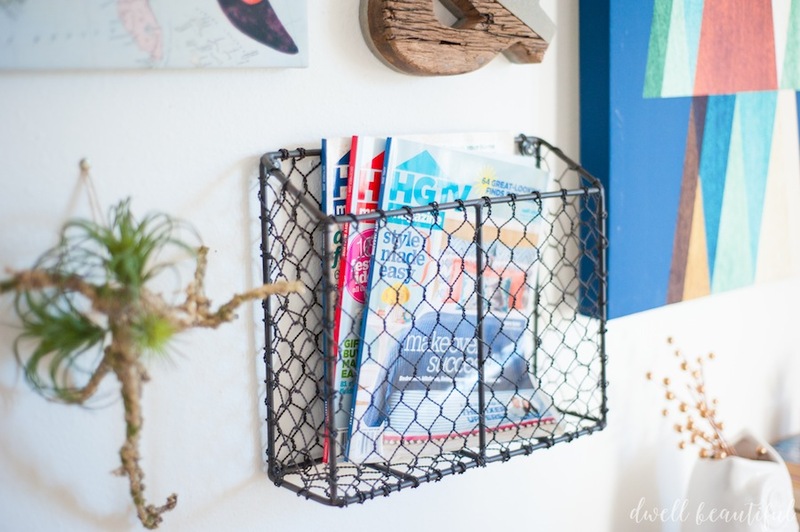 The best way to store magazines on a wall is to get a holder or bin, like this chicken wire one from CPWM, where you can layer your magazines with the covers facing out. I only stuck 3 in this holder for now, but since I screwed it securely into the wall, I could store a whole year’s worth of magazines in this baby, no problem. I don’t know about you, but I was always misplacing my keys, especially little-used keys like the one to garden shed, the extra car key, or the key for the padlock on the fence. 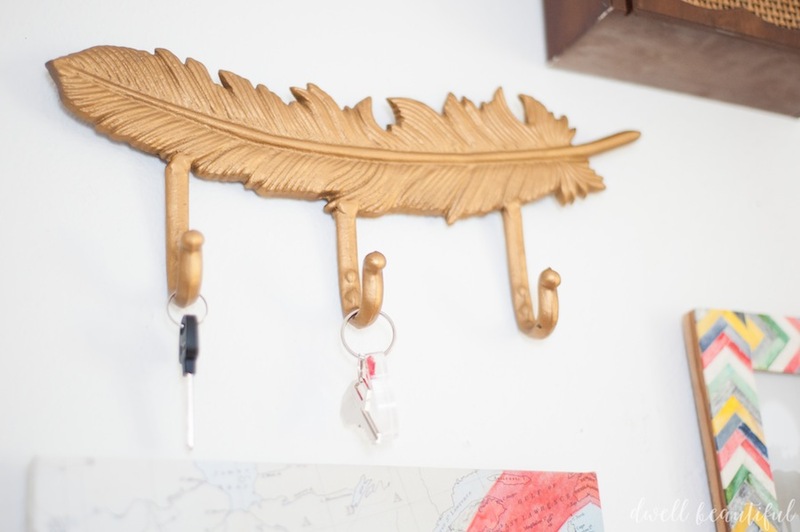 By incorporating some hooks, like this gorgeous gold feather, into your gallery wall, you can keep keys within reach while also making them an eye-catching part of your gallery wall. Since this gallery wall is right by the front door, it’s also a great place to drop our regular house keys so we don’t misplace them! You could also use these sorts of hooks to store anything from bracelets to extra hair ties, hats to scarves, and more. Just look for your prettiest and most stunning everyday items to store on your wall and you have instant functional art! 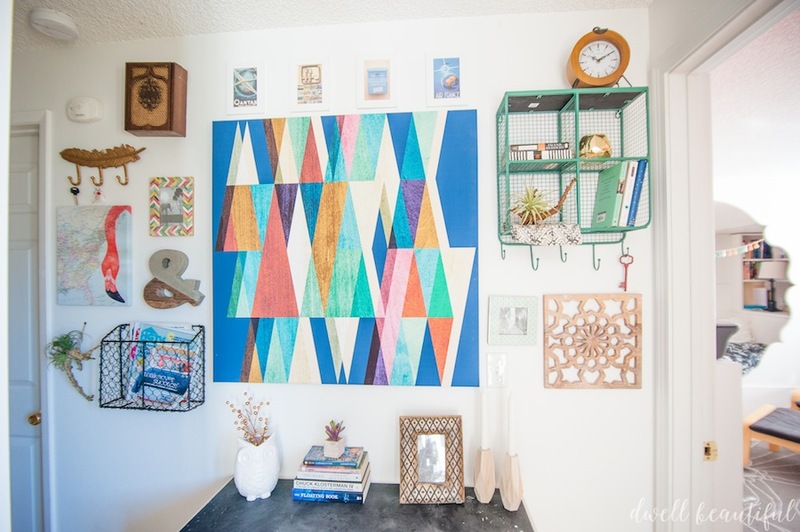 I had a ton of fun putting together this gallery wall with CPWM pieces – virtually everything you see on this wall came from their awesome collection. It’s really not too hard once you get going! Like Elizabeth says, start with an anchor piece (in my case it was the big beautiful geometric canvas) and then fill in items around it. It’ll all come together in no time! If you’re having trouble picking colors or themes, Cost Plus World Market has some great color inspiration. 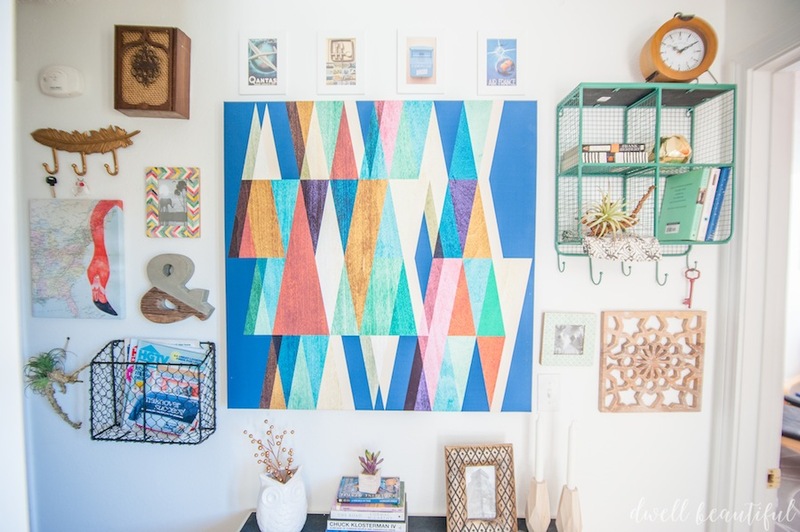 Look for pieces that have coordinating colors throughout; in my gallery wall I looked for pieces with blue, coral, and mint green as my primary colors with black, wood tone, and gold as accent colors. 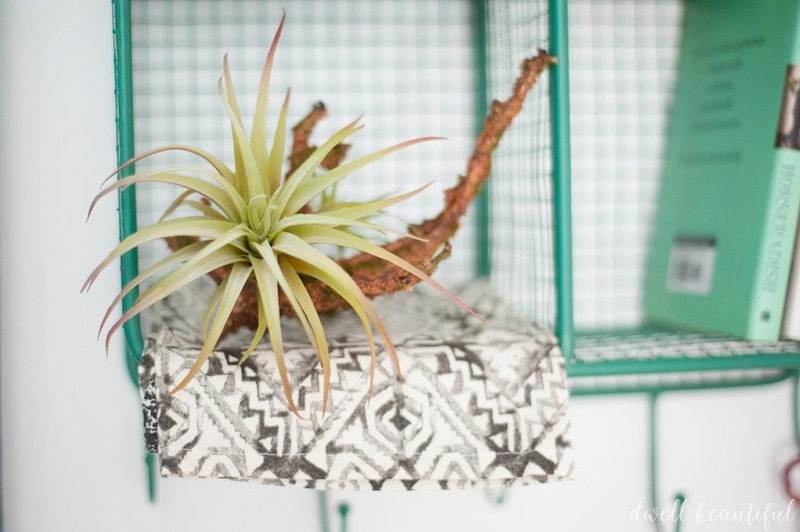 Include a couple of faux air plants or a piece of fabric (in this case a CPWM dishcloth) for visual interest and texture! Anything goes with a gallery wall, so look beyond the wall art section. Many table decor pieces (like my concrete and wood ampersand, or faux air plants) can be used on the wall for a very cool multi-dimensional effect! 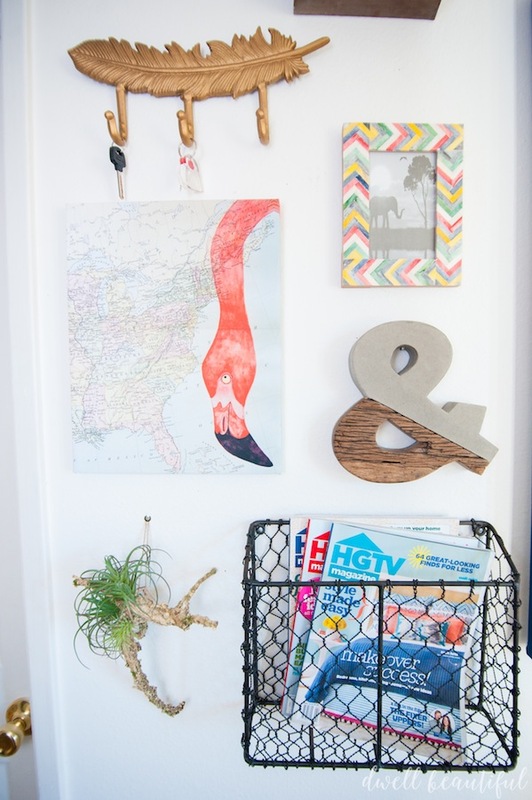 Try sprinkling a few interesting pieces throughout your gallery wall for a fun and quirky look. You gallery wall can even extend past the wall. Here I used another Cost Plus World Market frame that fit in with my vibe and stacked yet more books that went along with my color theme to keep the fun going. I just absolutely LOVE how this space turned out! It puts a smile on my face every time I come in the door. And the best part? I’m no longer searching for lost keys or wondering where the latest issue of HGTV magazine went. It’s all right where I can find it while keeping the beauty and visual interest high – what a great way to save space! That’s a workhorse of a gallery wall if you ask me! 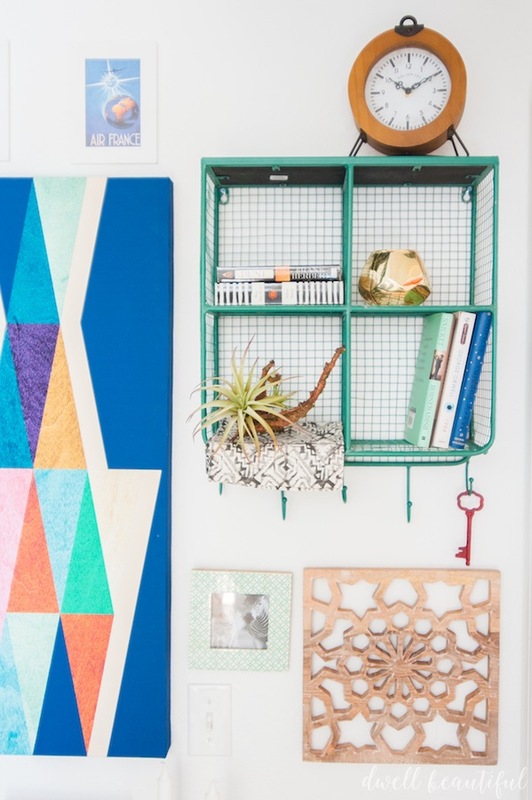 Now that you know a gallery wall can pull double duty and save space by keeping your items up and out of the way, how would you love it if you could spruce your own space on Cost Plus World Market’s dime?? That’s right! You could win a $5,000 grand prize Cost Plus World Market shopping spree plus a design consultation with the awesome Nicole Curtis!! Whatttt, I wish I could win this. Seriously. There are also 3 runner-up $1,000 gift card prizes up for grabs. You don’t want to miss this sweepstakes, believe me! ENTER TO WIN BY CLICKING HERE! Did you love the look of my functional storage gallery wall? The great news is you can get the look yourself at home (which would be a great way to spend that Sweepstakes cash, am I right?) by checking out all the products I used below. How do you save space at home? I do love the idea of storing books and magazines in hanging shelves and baskets. Thanks! I love this wall! It is such a clever idea to store stuff on a gallery wall. I would have never thought of that. I love the colors as well. Awesome ideas! I always like to include some three-dimensional and funky objects in my gallery walls and storage would be icing on top for sure! 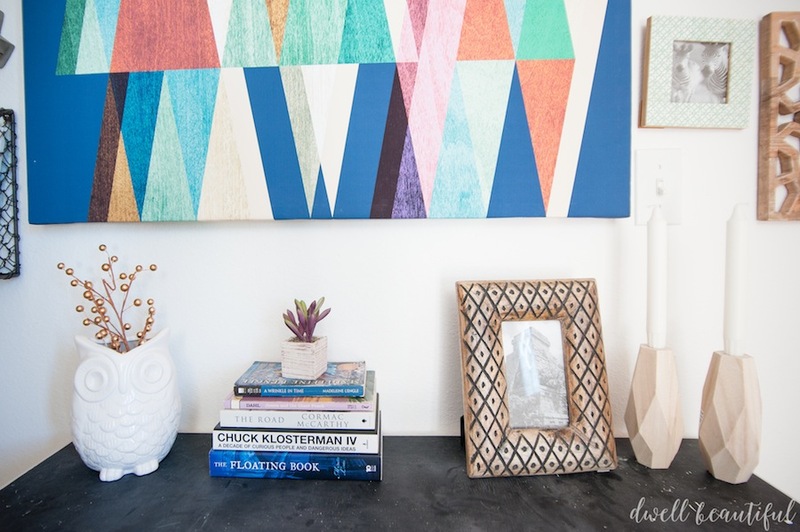 I love when there is dimension to a gallery wall! It makes it so much more awesome! It’s definitely more fun to have those unexpected little pops in there 🙂 Thanks! Stikwood Wall Living Room Makeover!